These popsicles are made with fresh watermelon, tequila and orange liqueur for a fun twist on everyone’s favorite summer cocktail! Newsflash! Popsicles are not just for kids anymore. In fact, these ones are not for kids at all. Nope, not one bit. But, by swapping out the tequila and orange liqueur for water and orange juice, they very well could be. And then everyone’s happy, see? Especially mom and dad. Whee! To create these crazy delicious, icy cold summer treats with a twist, just whirr up some fresh watermelon, lime juice, sugar and a healthy splash of good tequila and liqueur. Strain it through a sieve, then pour the fruity mixture into the molds if you can keep yourself from pouring yourself a glassful first! After about an hour of freezing, poke in some popsicle sticks, then let them continue hardening overnight, or at least 6 hours. Once they’re nice and solid, shimmy out your pretty watermelon margarita pops and slurp ‘til your heart’s content! These freshly made, fruity and flavorful pops are a perfectly easy summer treat for the big kids, and perfectly easy to make alcohol-free, too. Try them as a fun experiment to help you beat the heat, or make them for a crowd of margarita-craving friends and family. They make for a cute, tasty twist on everyone’s favorite cocktail! Combine all ingredients in a blender; puree until smooth. Strain mixture through a fine-mesh sieve into a large measuring cup, pressing on and then discarding solids. Skim off any foam; pour mixture evenly into molds. Freeze 1 hour. Insert sticks and freeze until firm, about 24 hours. To make non-alcoholic: Replace 2 Tbsp. orange liqueur with orange juice and 1/4 cup tequila with water. How fun! I just made my first popsicles last weekend and I was just thinking what kind I should make for this weekend so this recipe is absolutely perfect! And man, those watermelons look so juicy! Your pictures are beautiful! These look so refreshing. Georgia, these popsicles are everything I love about summer. Watermelon, margaritas, and something to nibble on to cool me off! Such a great idea! I want to have a summer party now and make these! 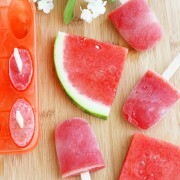 i just bought popsicle molds this week… gotta try these with my next watermelon purchase! Can picture myself sitting on the deck with one of these right now! I love these pops, Georgia! They look just like frosty pieces of watermelon – yum! Love love love these! Gorgeous and perfect for Summer! I must buy some popsicle molds, I have seen so many awesome ones lately. I’ll take any excuse to consume a cocktail in popsicle form! MUST make these soon. these are perfect! I still want to make your Watermelon Margarita’s, and now these too! What a fun treat for summer! I sent you an email about a Bake Sale – any chance you are interested? Georgia, these look awesome. I love that they’re especially for us mature adults ;) I need to get a popsicle mold ASAP! This is a very cute and fun idea! :D Plus, it sounds super refreshing for the summer. Oh these are perfect for a summer party, love this idea! These look delicious, Georgia–a great simple dessert or snack for when it’s too hot out to turn on the oven! This looks perfect for a hot day like today! you sure know how to cool me down on a sweltering day like today! these look so refreshing and so good, not to mention healthy too! i’d have TWO popsicles! I love their color! what a perfect treat for the hot weather. Great color and you can’t beat a classic for the summer heat. Grown-up popsicles…that is exactly what I need in my life! These sound so refreshing AND festive! Watermelon, tequila and orange liqueur = 3 of my favorite things that I haven’t though to combine! These grown up popsicles sound perfect, especially with our heat wave in Boston! I love summertime! These are summer treats for the whole family. I just have to make sure I know which ones are booze-free and which aren’t. Thanks for sharing. this looks so amazing.. definitely NOT for kids. OMG, I wonder how it would taste dipped in bittersweet chocolate, heaven! Gorgeous pics. Oh yes! This is my kind of treat! We’re having a major heatwave – a few of these would be perfect right now! Mmm…watermelon anything is good to me – but these look SUPER yummy and refreshing, just what we need with this heat wave. Great recipe! One-stop shopping on a popsicle stick! Holy YUM! I looooooove popsicles for summertime desserts; so easy and simple! Plus, watermelons are practically a necessity during the summer, so using up leftover chunks into homemade popsicles WITH BOOZE?! I’m all over this. These are such pretty pops Georgia! I always associate you with watermelon. Strange, I know, but the post you did on Watermelon Granita was what first brought me to your site so I was excited to see a watermelon post again :) And, it has tequila – bonus! This looks like so much fun and perfect for the upcoming 4th of July festivities. Thanks Georgia! Absolutely love these watermelon popsicles. So summery and lovely. I love watermelon so much, and with tequila and frozen…these might work as a popsicle and a drink. Love them! Beautiful! I just bought popsicle molds so I’m pinning your recipe to try this Summer! I love this trend of boozy popsicles that a lot of bloggers are getting into! I need to get a popsicle mold, stat! Watermelon Pops….brilliant, fresh and delicious. Hi Georgia! It’s 102 degrees today at Houston, and we just returned from Northern California, so the heat is definitely hard to handle. The popsicles look so refreshing, gotta go get some watermelons soon! What a great idea, Georgia! Love it – the perfect way to enjoy a margarita on a warm summer day! These are my kind of Popsicles! Love these! What a beautiful color, plus they sound delicious! I’m impressed, I must say. Really rarely do I encounter a blog that’s both educative and entertaining, and let me let you know, you’ve hit the nail on the head. Your thought is outstanding; the difficulty is something that not sufficient individuals are talking intelligently about. I am very completely happy that I stumbled throughout this in my seek for something regarding this.